New Positions! • Alumni Visit Campus • Wang Discusses School's Impact • Alumni Research & Commentaries • Our Newest Alumni • Thank You, Ambassadors! Coming soon! Yes, 2016 is a commencement year and we’ll be gathering June 16-18 for Commencement Weekend, with Congressman John Lewis as our commencement speaker. This is the time not only to celebrate our newest graduates but also to welcome back our alumni. We’ve had more than 50 alumni each commencement and would be delighted if you were part of the group this year. For this issue of Findings, I’d like to draw your attention to the interview with several of our current students. Jakub Hlavka, Therese Jones, Jonathan Wong and others will fill you in on what they’ve been up to. Actually, Therese hasn’t given you the whole picture. She will also be on Jeopardy! this Friday evening, March 4. We’ll be live-tweeting from the watch party in the student lounge so you can follow all the action. I should note that Therese is following in the distinguished footsteps of long-time Pardee RAND professor Steven Popper who won on five consecutive Jeopardy! shows in 1988, as well as appearing several times in the Tournament of Champions. More importantly, Professor Popper will be our next Harold and Colene Brown Faculty Fellow in residence beginning March 28. If the student interviews whet your appetite for more Pardee RAND news, keep an eye on your mailboxes because our alumni will soon be receiving the 2016 Dean’s Report to the Board of Governors. Let us know what you think! I'll close by putting in a plug for the ever-strengthening Pardee RAND alumni network. We've recently sent out the latest Alumni Directory. 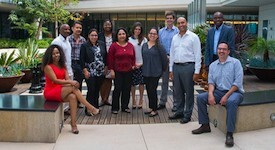 It has been terrific for connecting alumni with each other and with our current students. Pardee RAND's Commencement Weekend will be held Thursday, June 16 through Saturday, June 18. 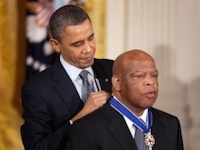 We are delighted to announce that, thanks to a letter-writing campaign from students and faculty, our Commencement speaker will be The Honorable John Lewis, the renowned civil rights activist who represents Georgia's 5th district in the U.S. House of Representatives. We hope you will join us for Commencement on Saturday, June 18, as well as for our Alumni-Student Mixer on Thursday night and the Celebratory Dinner on Friday night, when we will be presenting our third Alumni Leadership Award. You can read more about our honorees — and the weekend's schedule — on our Commencement page. Alumni will receive their invitation in early spring but please mark your calendars now. We had more than 50 alumni attend the 2014 Reunion and Commencement Weekend, and we'd love to have you take part in the festivities. On-the-Job Training (OJT) is a unique and enriching facet of studying at Pardee RAND. Several current students shared recent project contributions and their more ... uncommon experiences. The RAND Methods Center for Gaming hosted "Come Play a Game! An introduction to Table Top Exercises (TTXs)" as part of its education and outreach efforts. Center Co-Director Stacie Pettyjohn and student Ellie Bartels (cohort '15) led the evening session attended by 19 students. (Bartels also wrote Getting the Most Out of Your Wargame: Practical Advice for Decision-Makers for War on the Rocks, a website that features analysis and debate on foreign policy and national security issues.) The session was designed to provide an introduction to gaming and how it can be applied to a range of policy problems from traditional defense topics to healthcare and climate change. In addition to discussing the basic concepts behind gaming and game design, the session included participation in a short policy game. During the first part of the session, students were introduced to the emerging field of gaming, and how research design principles taught in core Pardee RAND classes can be applied to game design. The game provided students the opportunity to students to explore these principles through role playing scenarios. Participants served as governmental and nongovernmental stakeholders responding to a cyber-attack on critical infrastructure. Through the session, students focused on how gaming could be applied to OJT and dissertation research. A new course this quarter, "The U.S. Rebalance to Asia," explores economic, geopolitical, security, and military factors at play in the renewed U.S. policy focus on Asia. The course is led by professors Michael Chase, Cortez Cooper, Timothy Heath, Scott Harold, and Dave Ochmanek and is open to a RAND-wide audience. Discussions have included the stakes of the U.S. rebalance, focusing on economic, demographic, and geopolitical trends and the region's growing importance; China's rise and its implications for the United States and the region; military, economic, and diplomatic components of the U.S. rebalance; and regional perspectives and the geopolitical dynamics in Asia. Between January 11 and 15, Pardee RAND hosted sculptor Phillip Ratner as its artist in residence. 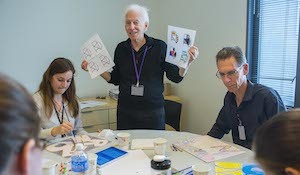 A joint effort with Emerging Policy Research and Methods, Ratner's time at RAND included a schedule of studio sessions and interactive art workshops. "This is an opportunity for RAND staff and Pardee RAND students to interact in ways they might not otherwise," said Dean Susan Marquis. "Creativity has been the foundation of art and of many research projects at RAND. I hope Phil's presence and the workshops will generate new ways of thinking here at RAND." Fifteen Pardee RAND students participated in the four workshops. 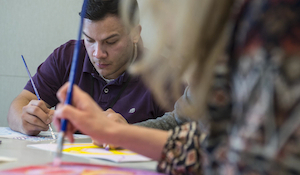 Daniel Basco (cohort '14) commented, "I had to be creative in a completely different way than I'm normally asked. I think everyone involved walked away from the workshop a little happier and a little more relaxed." Ben Batorsky (cohort '12) and Crystal Huang (cohort '13) and professors Hangsheng Liu, Erin Audrey Taylor, and Soeren Mattke coauthored Understanding the Relationship Between Incentive Design and Participation in U.S. Workplace Wellness Programs in American Journal of Health Promotion. The article examined how employer characteristics relate to the use of incentives to promote participation in wellness programs, as well as the relationship between incentive type and participation rates. Ervant Maksabedian Hernandez (cohort '12) and professor Rosalie Pacula coauthored In the Weeds: A Baseline View of Cannabis Use Among Legalizing States and Their Neighbours in the journal Addiction. The paper found that 86% of people who have used medicinal marijuana also use it recreationally. David Manheim (cohort '12), with professor Josh Baron, coauthored National Security Implications of Virtual Currency: Examining the Potential for Non-state Actor Deployment, which examines the feasibility for non-state actors, including terrorist and insurgent groups, to increase their political and/or economic power by deploying a virtual currency like Bitcoin for use in regular economic transactions. Zhimin Mao (cohort '11) wrote a blog post, China Has Done More About Pollution Than You Think (But It Must Do More), for The Diplomat. She also received IIASA's YSSP Peccei Award and funding for her paper "Evaluation of Costs and Effectiveness of Pearl River Delta's Air Pollution Reduction Action Plan." Mahlet Woldetsadik (cohort '13) wrote a RAND blog post, Africa Succeeds in Meeting Many Long-Term U.N. Development Goals. Susan Burkhauser (cohort '09) is now an institutional research associate at Loyola Marymount University. Shira Efron (cohort '11) is now an associate policy researcher at RAND. Thomas Lang (cohort '03) was promoted to senior consultant at LMI. Ying Liu (cohort '04) was promoted to associate director, Global Market Access, Health Economics and Outcomes Research, Biogen. Beth Katz (cohort '04) is now a research analyst at El Camino College. Thomas Martin (cohort '86) is now an evaluation director at the Positive Education Program. Arnab Mukherji (cohort '01) is now an associate professor and chair of public policy at the Indian Institute of Management. Kartika Palar (cohort '06) is now an assistant professor in the division of HIV, Infectious Diseases and Global Medicine at the University of California, San Francisco. Samantha Ravich (cohort '92) was named to the national security team of Kasich for America. Oleksandr "Alex" Rohozynsky (cohort '00) was promoted to director of development results at DAI. Jesse Sussell (cohort '10) is now an associate research economist at Precision Health Economics. Henu Zhao (cohort '07) is now a research programmer at the University of Southern California's Price School of Public Policy. Finally, while not exactly a new position... congrats to Kathy Lohr (cohort '75) who just celebrated her 20th anniversary with RTI International! Ben Bryant (cohort '05) visited Santa Monica in January to talk about his work as an economist with the Natural Capital Project's Freshwater and Terrestrial Services Team, focusing on water funds and joint dependencies between roads and ecosystems. Students were able to hear how Bryant leveraged his training at Pardee RAND into a position first with the Millennium Challenge Corporation and now in his role at the Natural Capital Project. Robert Reichardt (cohort '95) happened to be in town the same day and joined Pardee RAND for Bryant's talk. Reichardt provided insight on his accomplishments since finishing his Pardee RAND dissertation, a path that encompasses a sector-spanning career involving work in academia, research, and consulting in the field of education policy. Kartika Palar (cohort '06) was in town in February and shared her thoughts on moving from Pardee RAND into the field of public health research. 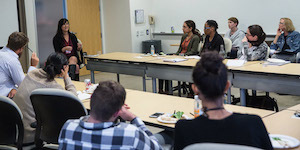 Students were interested to hear about Palar's journey from a postdoctoral researcher into a career as an assistant professor conducting research for a university center. Especially relevant were her thoughts on finding a mentor and successfully obtaining funding for her research. If you will be in the area (permanently or just visiting) and have time to talk with students about your career, please let us know! Since leaving Pardee RAND in 1992, alum Hui Wang (cohort '88) has had a dynamic and extensive career. As CEO of First China Capital, he is a deal maker in international investment and mergers and acquisitions (M&A). We recently asked Wang, our alumni representative to the Pardee RAND Board of Governors, a few questions. Q: How did your education at Pardee RAND help you in your career? A: First of all, my education helped me form a habit of being dedicated to and, sometimes, obsessed with quality. Second, it made me realize that, in this world of uncertainty and the unknown, I should always try to work with others as a team, which often improves the result of one person's effort. Third, it helped me understand that thinking objectively and innovatively enables a person to go far. Robert DuBois (cohort '87) partnered with professors Tom Concannon and Dmitry Khodyakov on Employer, Insurer, and Industry Perspectives on Patient-Centered Comparative Effectiveness Research, which examines PCORI's comparative effectiveness research. Chaoling Feng (cohort '09) and professor Michael McNerney coauthored the RAND report Defense Institution Building in Africa. Michael Shanley (cohort '85) and professor Chaitra Hardison developed Essential Skills Veterans Gain During Professional Military Training, a quick reference card to help hiring managers understand how to translate veterans' skills for a civilian workforce. Bradley Stein (cohort '97) coauthored a RAND report, Payoffs for California College Students and Taxpayers from Investing in Student Mental Health. David Apgar (cohort '80) wrote a commentary, When to KISS, which argues that "Keep It Simple, Stupid" is "bad advice for complex problems. Complex challenges require complex solutions." Arthur Brooks (cohort '96) wrote a counterintuitive New York Times commentary, To Be Happier, Start Thinking More About Your Death. Jordan Fischbach (cohort '04) coauthored a RAND blog post, COP21: Ambition and Momentum with fellow professors Rob Lempert and Debra Knopman. Jeremy Ghez (cohort '06) wrote a blog post, Anticipating Your Next Battle in Business and Beyond: The Temptation of the Panic Button, for Knowledge@HEC. Katia Vlachos (cohort '98) wrote a Huffington Post blog post in which she says the EU is trying to make Greece Europe's New Ghetto. Casey Wardynski (cohort '97), superintendent of the Huntsville, Ala., school district, was interviewed by a local news station for a 30-minute program on Leadership Perspectives. Ning Fu (cohort '08); dissertation: Once A Cure, Second A Waste: Examination of Hospital Readmission Rates Of the Commercially Insured Under 65 Population. She is a research associate at the Center for Health Financing, Policy and Management at the University of Southern California. Abigail Haddad (cohort '09); dissertation: Analyzing Reduced Teenage Employment, 2000-2013. She is a statistician with the National Guard Bureau, Readiness Center. Edmundo Molina-Perez (cohort '11); dissertation: The International Diffusion of Climate Change Mitigation Technologies (CCMTs): Policy Challenges for International Coordination Under Conditions of Deep Uncertainty (online version forthcoming). He is a research professor at the Monterrey Institute of Technology and Higher Education (ITESM) in Mexico. Ahmad Idrees Rahmani (cohort '08); dissertation: Political Leadership in Afghanistan: Identifying and Assessing Determining Factors (online version forthcoming). Mollie Rudnick (cohort '11); dissertation: Helping Districts Hire Better Teachers: A Case Study Evaluating the Effectiveness of a District's Teacher Hiring Practices. She will be a Harvard Strategic Data Fellow starting in July 2016. Saw Htay Wah (cohort '11); dissertation: Three Essays on the Development of the Labor Market and the Private Sector in Burma (Myanmar). Thirty alumni served as "alumni ambassadors" this year, which involved reaching out to Pardee RAND applicants to interview them and to share their student and post-graduation experiences. With more than 130 applicants this year, we appreciate the keen insight you were able to provide the school, enabling us to admit a very first-rate cohort for fall 2016! Continuing the festivities, Dean Marquis hosted a holiday lunch in Washington, D.C. for alumni on December 21; she was joined by David An (cohort '10), Diana Epstein (cohort '05), Mark Gabriele (cohort '93), Aaron Martin (cohort '07), Leslie Mullins (cohort '12) and Josh Weed (cohort '01). 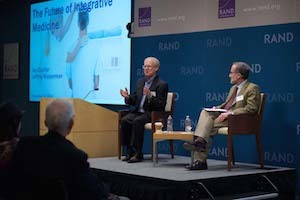 The RAND Alumni Association (RAA), in partnership with the Pardee RAND Graduate School Alumni Association, hosted an evening of conversation about the future of integrative medicine in RAND's Santa Monica office on December 16. 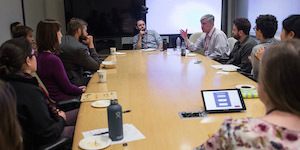 RAND health experts Ian Coulter and alum Jeffrey Wasserman (cohort '85) discussed the place of complementary and alternative medicines in the health care system and the policy implications for regulation, licensure, and reimbursement. Pardee RAND alumni Michael Beltramo (cohort '70) and Frederick Beddingfield (cohort '96) also attended. 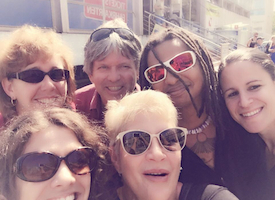 A few weeks ago, Dean Marquis headed north and enjoyed a visit with some Bay Area alumni. She was joined at dinner by Brent Fulton (cohort '01), Hugh Levaux (cohort '94), Kartika Palar (cohort '06), and Helen Wu (cohort '07) and had lunch with Sam Loeb (cohort '00). She was also happy to reconnect with Debbie Lai (cohort '08) and Chris Sharon (cohort '07), who recently relocated to the Bay Area. Dr. Adam Levine, primary investigator on the International Medical Corps' Ebola Response Team, will visit Pardee RAND on Friday at noon to discuss his organization's Ebola response and ongoing efforts in West Africa. 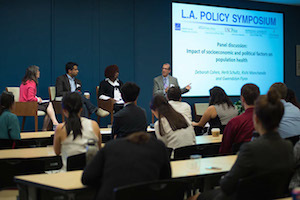 Join researchers, faculty, and graduate policy students from the five leading policy schools in Los Angeles County for the 11th annual L.A. Policy Symposium. This year's theme is "People, Planet, Profits: Policy Solutions for a Changing World" and will feature keynote speaker San Bernardino County Supervisor Josie Gonzales. The symposium will highlight students' research presentations and include panels focused on national security and strategies for peace, climate change and global health, and the use of technology for social good. Help us recruit applicants for this summer's Faculty Leaders Program! Formerly the Summer Faculty Workshop, the course is a 5-day, hands-on policy analysis training program for faculty members across disciplines. Ideal applicants serve a diverse student population and will be interested in augmenting their teaching, research, and mentoring with the tools of public policy analysis. Fellowships covering tuition and travel expenses are available for the program, scheduled for July 18-22, 2016. The application deadline is March 21.